Check out the outboards on this beast! 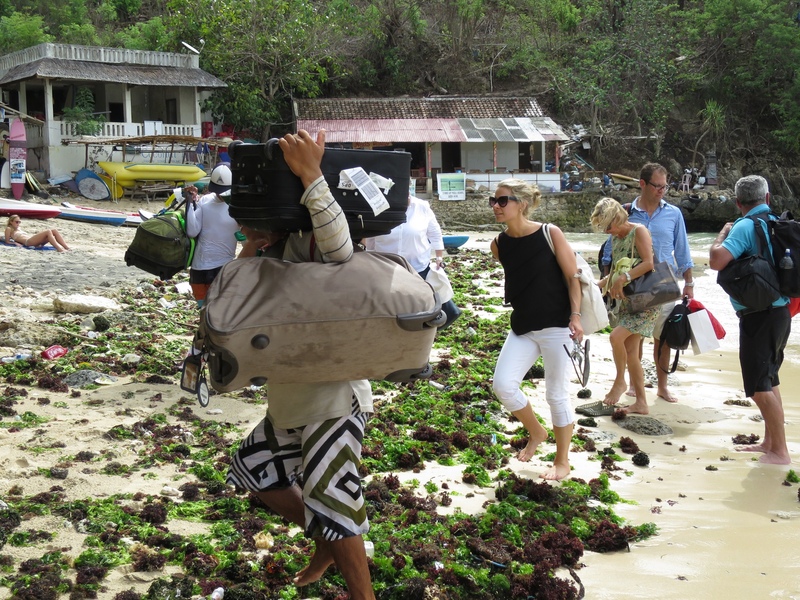 Actually, it’s not not Jakarta we are at, but Bali…. 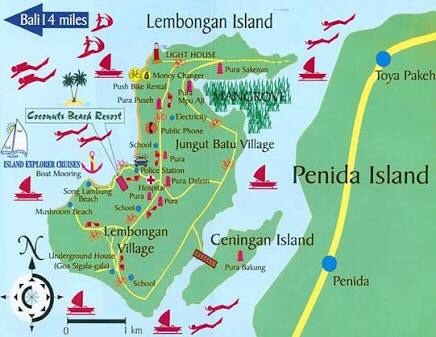 and technically not even Bali, but a small island 15 kms off Bali named Nusa Lembongan. Maybe it should be called Paradise! Eight of us, five Aussies and three Kanucks, caught the Garuda Airlines flight 727 from Perth, which took off at 8am,and after an uneventful flight, the volcanoe was quite for a change, we landed at Ngurah Rai International Airport on Bali island at 11:35 am. Despite the Indonesian Authorities promising to change the VoA (Visa on Arrival) rules for Aussies, they still haven’t done so, and so while we were charged US$35 each before they would allow us into the country, the Canadian delegation travelling with us sailed through immigration with their wallets intact. Is that fair? At Customs, Yineka-mou and I were singled out by an Indonesian Customs Officer for a ‘special’ baggage check….oh no….just as we thought that they hadn’t noticed the case of Moët Chandon in one of our suitcases. Of course , no chance, it was not just a random check… All luggage including carry on, is passed through the X-ray machine just after the baggage carousel. The young officer asked us to open our cases and with thoughts of Schappele Corby uppermost in my mind, he checked the contents….. “what that” he asked, pointing to the case of Moët. YM piped up with the explanation that it was her birthday on Boxing Day and it was to help her celebrate. ” Is wine?” He enquired….. ” nooow, it’s only champers” says YM in answer. He picked a bottle up, inspected it closely, but it was obvious that his command of French was about as good as my mate Paul’s…. Which is to say not that good. “And that” he asked, pointing to the bottles of Bombay Gin, Vodka and Rum we had bought ( at outrageous prices) from JR Duty Free at Perth Airport. To say he wasn’t impressed would be … well, let’s just say he wasn’t. Just so you know, the allowance into Indo is strictly ( ha ha) one litre of alcohol per person. “Come , come with me” he ordered, and we accompanied him into his office to ‘discuss’ the penalties for trying to smuggle alcohol in the country. The fact that I’d actually declared the excess alcohol didn’t impress him…… However, let’s not go into too many details here, but just leave you with the explanation that we came to a negotiated settlement from which all parties emerged happy! 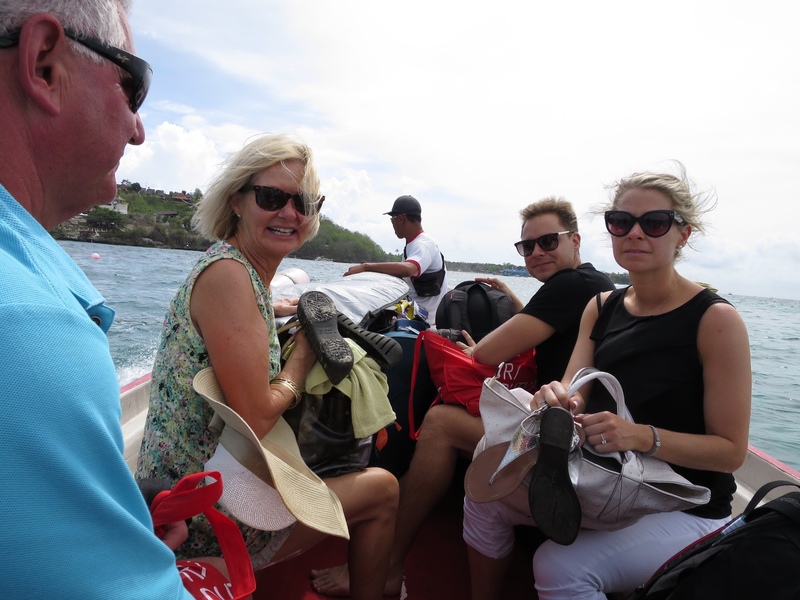 ….. And a few minutes later, all of precious cargo of happy juice intact,we were outside of the airport where our man from Rocky Ferries was waiting to take us to Sanur to catch the Rocky Express ferry boat to Nusa Lembongan. I hadn’t been to Bali for about 6 years, and boy, did I see a difference in that time. I couldn’t believe the traffic, so congested, and so built up now. Nice to see though that some things never change, like the kamikaze style driving and riding that the Balinese use. I was in the front seat of the minivan taking us to the boat, and Wayan was the driver. He had a most disconcerting habit of looking at me whenever I asked him a question, or when he asked me a question. I pretty soon stopped talking to him and hoped that he’d keep his eyes on the road more frequently than he had so far. 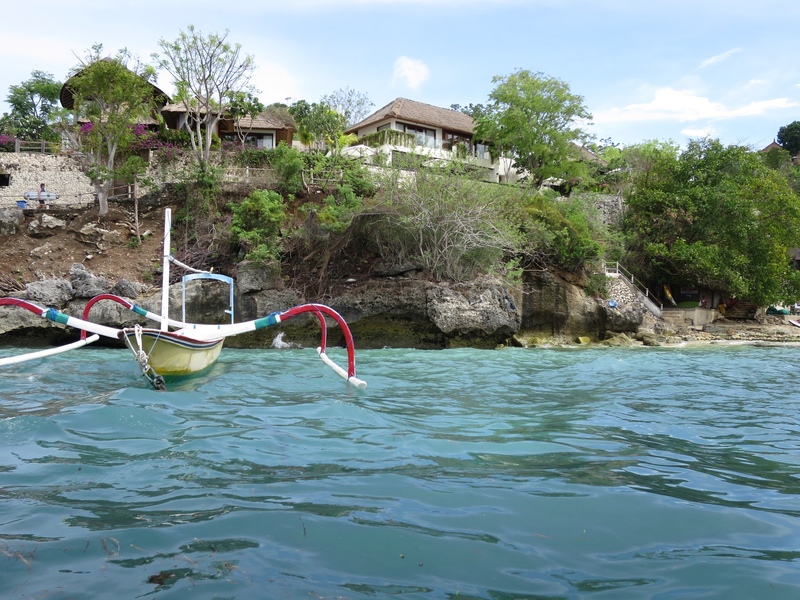 Unbelievably, we reached the beach ( yes, the beach, there isn’t a harbour in Sanur, nor a jetty even, and all the boats leave from the beach.) where the ferry terminal is…… The ferry terminal is a term used here very loosely….it’s a makeshift shed with open sides ( no walls in other words) with a few seats inside. 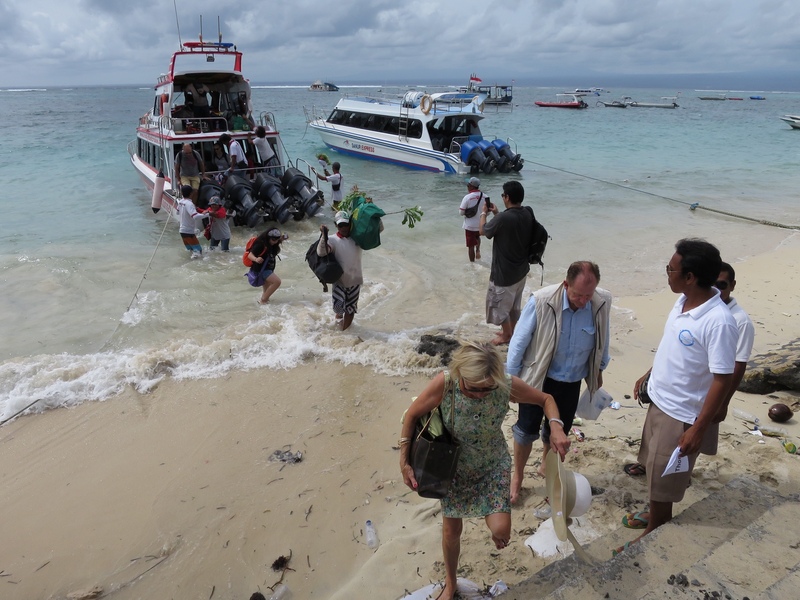 The Rocky Boats have a reputation of being among the safest of all the many different boats that cross over to Lembongan each day. As far as I could tell, that meant that unlike many of the other companies they had a life jacket for each passenger….. In theory at least. 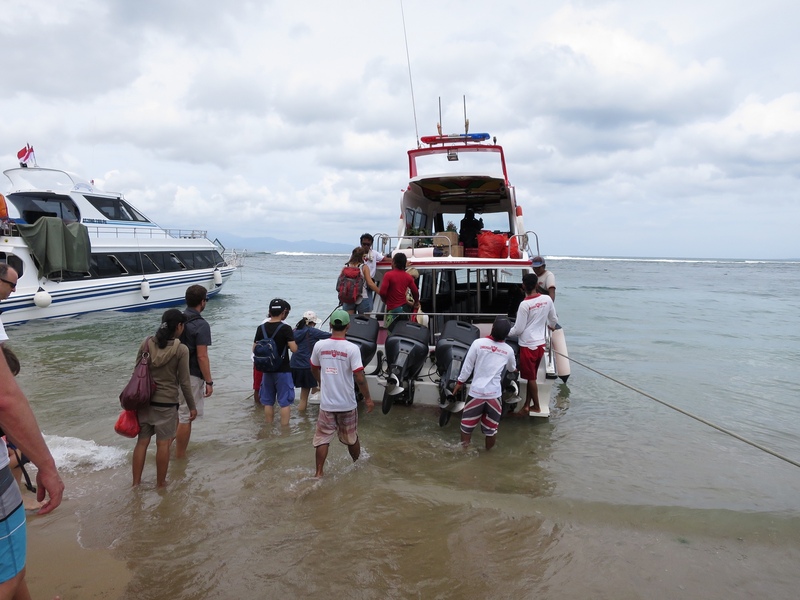 Apart from the 9 of us, ( we had picked up another member of our posse, IC, at Bali Airport) there were about a dozen other passengers waiting to board, and so while a team of porters hefted all the luggage down the beach and onto the boat, we also began embarkation. This meant removing your shoes, hitching up your short or skirts, and wading through the waves to the boarding ladder at the back ( stern?) of the boat. 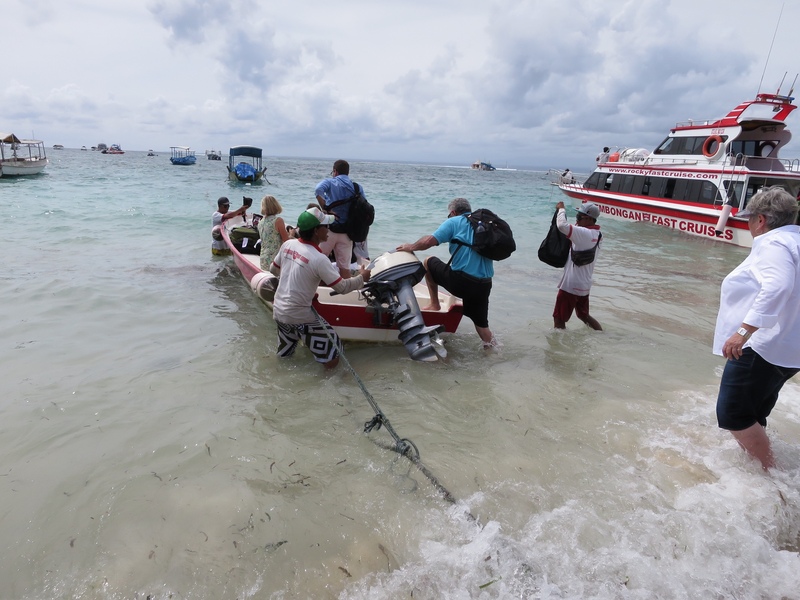 The 30 minute trip over was a little bumpy as the swell was huge, two to three metres, but the boat made it to Nusa Lembongan without incident, and we began the disembarkation. The ferry boat couldn’t ‘beach’ ( I was going to say ‘dock’ but there isn’t one) where it usually did because of the swell, which caused big surges on the beach, so it docked instead a few hundred metres away. What did we care, we had made it… Well almost. We now had to clamber over the stern and time our entry into the surf to coincide with a receding surge. Good fun, unless you get the timing wrong, in which case you’ll get very wet! We Are met at the beach by two of the staff from our villa, Villa Lago, who told us that we had to get into a smaller boat, along with all our luggage, to make the final leg of the journey to Coconut Beach, where the villa is located. I know have an idea of how the Refugees/ Immigrants from Syria must have felt trying to reach Greece…. 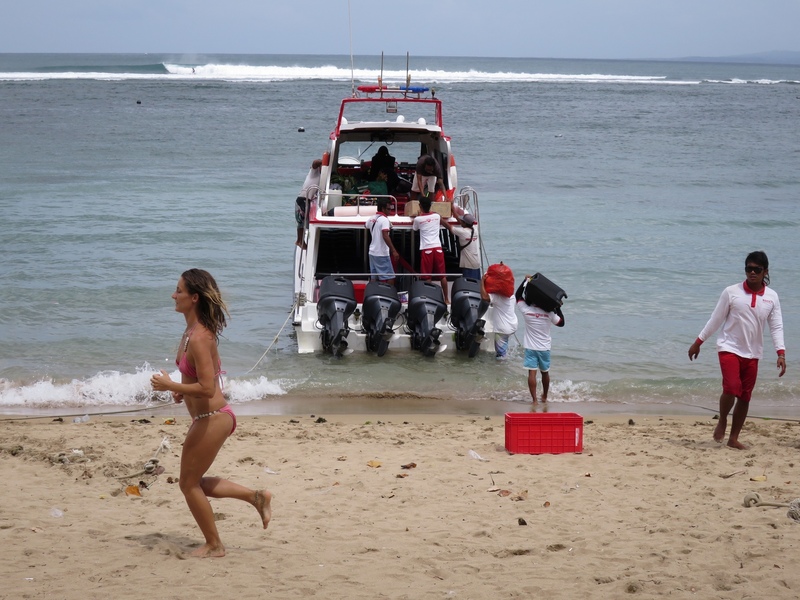 It was only a small dingy, and with seven of us and the skipper, along with all our luggage and a surfboard onboard, we were pushed out into the surf by some helpers. Now one of the first things they teach you at Boating School was to ALWAYS start your outboard motor BEFORE you cast off ropes. Our skipper must have been home sick when they taught this lesson, because it was only when we left the shore did he begin to pull the starter rope on the outboard. Thankfully, on the second attempt it started, and we headed into the surf break, rode into it, and then beyond into relatively calmer waters. Phew! There was a lot of nervous laughter from my fellow passengers, especially from BZ, who hails from Canada and isn’t that used to surf. 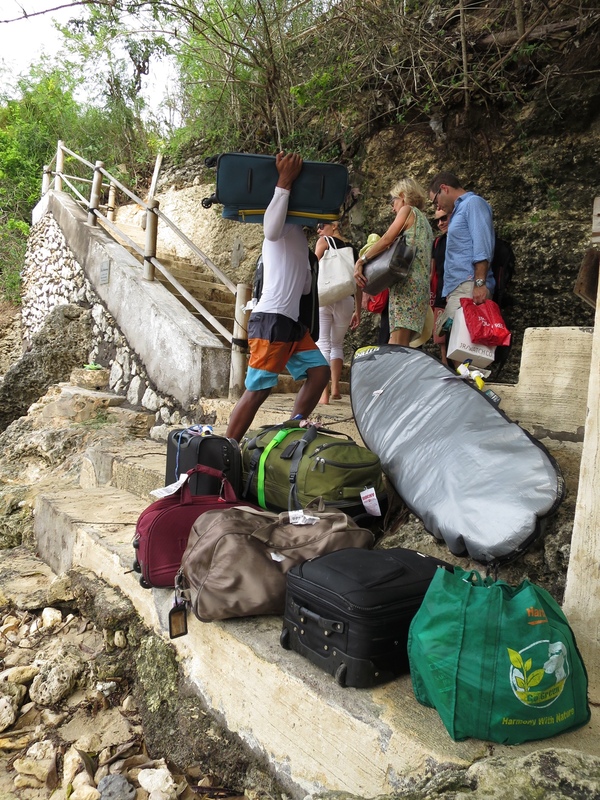 Our luggage, stacked in the bow, took a few big waves and was by now soaking wet. Coconut Beach is really just a small cove just around the headland from the main village of Jungut Batu, and the swell here wasn’t as bad, so our skipper from Rocky Ferries beached our dingy expertly, and we all quickly hopped off, while our luggage was being snatched out of bow by a gang of locals….. were they stealing it, or merely helping?